A probate attorney can help you prove the validity of a Will. What is Probate and How can a Probate Attorney Help? Probate is the process of proving one’s Will. 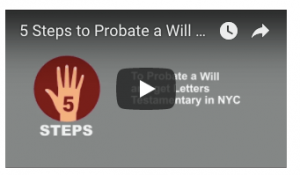 Probate literally means “to prove” in Latin. When a person dies leaving a Will, that person’s nominated Executor should take the Will, the Death Certificate, and the standard packet of Probate forms to the Surrogate’s Court in the County where either i) the Decedent died; or ii) the Decedent left property. The Surrogate’s Court will review the documents and, provided all is in order, issue Letters Testamentary. Should I Engage in Estate Planning to Specifically Avoid probate? It is all a matter of preference and a question of what is in your estate. Some people do not want to belabor their family and friends with the process of gathering the paperwork and going to Court. Some people prefer to avoid the additional expenses of hiring a probate attorney, paying for Letters Testamentary, and paying the filing fees involved in having the Court process payment. Some people are concerned that their investments will drastically decline in value in the time (sometimes a month or two) that it takes to have at least a preliminary executor appointed to give direction and manage the assets. If you fall into any of the above, then you may want to consider avoiding probate. Other people review their assets, see that they have a house, retirement accounts, and assets in checking or savings or low risk funds and believe that their assets will remain intact during the time that it takes to have a fiduciary appointed. These people also tend to appreciate judicial supervision over their assets to ensure that funds are not converted. If you fall into this group, then you may want to consider having your fiduciary go through the probate process. You may want a probate attorney to help you. In order to probate, you will need to (i) gather documents; (ii) fill out forms; (iii) go to court; and, (iv) pay the fee. You may also decide to hire a probate attorney. Click here to read our probate guide. Let’s discuss each in turn. Gather the necessary documents to file the Probate petition. Fill out the appropriate forms to file the Probate petition. List the next of kin, primary executor, and adversely affected beneficiaries in paragraph 6 of the Petition. Put everybody who is mentioned in the will and who is not in paragraph 6 in paragraph 7. Either a “Waiver of Process; Consent to Probate” (“Waiver”) or a “Citation” for everybody listed in paragraph 6. If the person agrees to your appointment as Executor, have that person sign a Waiver. If that person does not agree, then ask the Court to issue a Citation that you will need to serve upon that person. Click here to read more about serving papers at rklawny.com/resources. Notice of Probate for everybody listed in paragraph 7, along with an Affidavit of Mailing of Notice of Probate. Affidavit of Assets and Liabilities. Gather your money to file the Probate petition. Go to the Surrogate’s Court in the County where your Decedent died or had property to submit all the forms and pay the fee. If the Court issues a Citation, then attend Court on the return date of Citation. If nobody appears and objects, the Court will issue letters. If somebody objects, consider calling an attorney. Facts and circumstances may vary. If you have nuances, consider contacting a probate attorney familiar with the local rules. We are committed to expeditiously and efficiently handling your Probate and Estate Administration needs. We are experienced probate attorneys. Please Contact Us to discuss your goals.